Heat transfer vinyl (HTV) is a material that can be cut by hand or machine and applied with an iron, or heat press to many different textiles and materials. I have been working with HTV for several years and have learned that it’s so easy to use, but also easy to make basic mistakes. I’m still new to Cricut and using the Cricut Maker, so let me share my first impressions of Cricut Everyday Iron On. If you missed it, check out opening maker box, my unboxing review of Cricut Maker. Apply to fabric, wood, and more! You can apply Cricut Everyday Iron on to materials other than fabric. I regularly use this instead of Cricut Premium Vinyl on journals and wood signs (be prepared to test before you apply, as different materials will mean different temperature and pressure). Iron on vinyl is thinner than adhesive vinyl and I think it makes the final result look more like it’s been painted on. Weeding is the process of removing excess vinyl (like the background of a line drawing) from your design. Cricut Everyday Iron On is easy to weed using a Cricut Weeder tool. If you are weeding a lot of designs, consider buying a light pad to ease the strain on your eyes and speed up the process. You can clearly make out the cut lines and slice your weeding time in half by using a light pad. Just lay the Cricut Everyday Iron On atop the Cricut Bright Pad and turn it on. You will see the light shining through the seams in between cuts. This makes it simple to see and weed out the unwanted iron on material. Trust me. Invest in a light pad and give your eyes a break. Both the Cricut Maker (cutting machine) and Cricut EasyPress 2 (heat press) have automated settings for use with Cricut Everyday Iron On. These settings are spot on. No guesswork and no testing required. The settings just work. What a relief! I was nervous making a live video for Instagram for my second ever heat press with the Cricut EasyPress 2. But because I followed the simple directions provided, it worked perfectly. Check out the time I posted this near-fail to IGTV. I had to press the vinyl down in spot that didn’t receive full pressure, but other than that… it worked perfectly. Had I cut the design with the exact size of the Easy Press in mind, I would have imprinted with one press! Using Cricut materials means you can use the default material settings. Woohoo! Cricut offers three different cut mats of varying grip strengths. 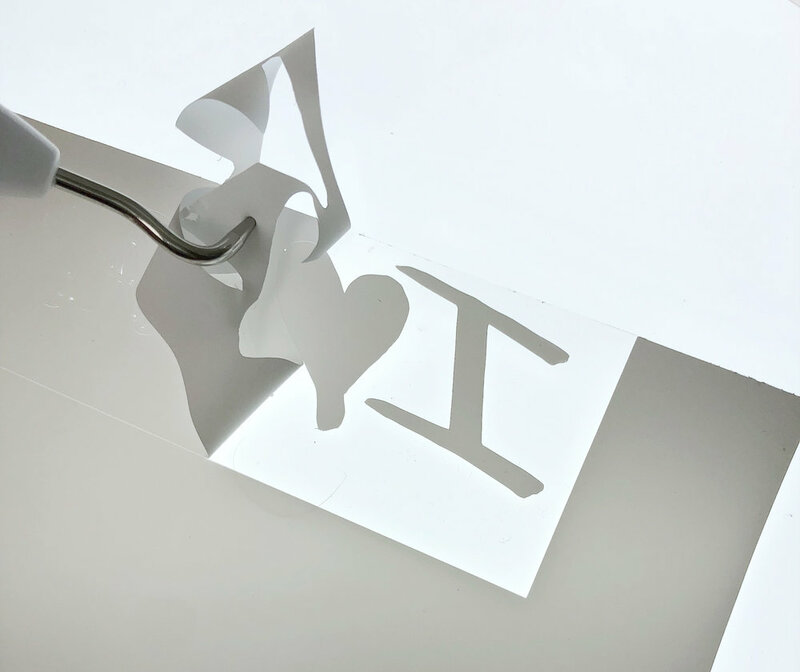 The go-to mat for use with Cricut Everyday Iron On and any adhesive vinyl is the Lightgrip mat. You don’t need any more stick than this mat has to offer. It holds the material firmly in place and releases without fuss. A regular or strong grip mat is too sticky. The Cricut Lightgrip mat is blue! Oh my goodness: I went there. You cannot effectively heat press using a household iron. Let me back up a second and start by saying I have successfully made pillows and t-shirts using a standard household iron. The vinyl adhered and remained on the fabric through several washes. You CAN use an iron with Cricut Everyday Iron On, but the outcome will not be consistent. A perfectly adhered result will only happen when you use a heat press or Cricut EasyPress 2. Both machines can provide even temperature and pressure that just isn’t possible with an iron. Investing in a heat press or Cricut Easy Press 2 will save you from headaches of unevenly adhered vinyl. If you’re making a one-off craft for yourself or for friends, by all means use an iron. It’s not impossible. 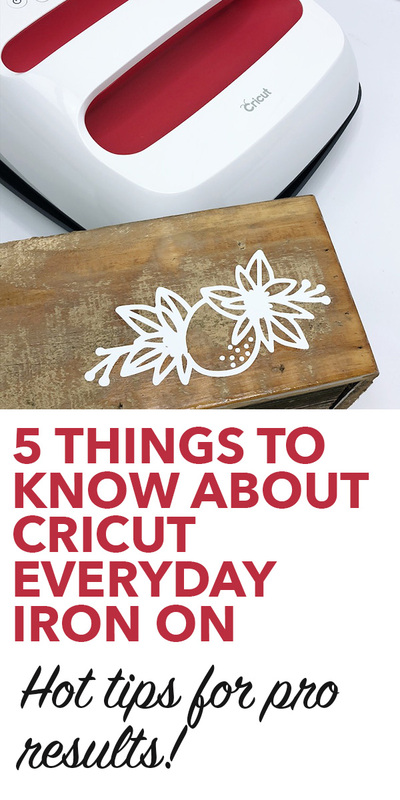 I hope these quick tips will help you get started with Cricut Everyday Iron On. There are like 36 colors available, but be sure to always keep stock of black and white for last-minute projects!